The kaleidoscope was invented by Sir David Brewster, a Scottish scientist, in 1816, and patented (GB 4136) by him in 1817. He named his invention after the Greek words, kalos or beautiful, eidos or form, and scopos or watcher. So kaleidoscope means the beautiful form watcher. Brewster's kaleidoscope was a tube containing loose pieces of colored glass and other pretty objects, reflected by mirrors or glass lenses set at angles, that created patterns when viewed through the end of the tube. Later in the early 1870 s, an American called Charles Bush (1825-1900) improved upon the kaleidoscope and started the kaleidoscope fad. Charles Bush was granted patents in 1873 - 1874 related to improvements in kaleidoscopes, kaleidoscope boxes, objects for kaleidoscopes (US 143,271), and kaleidoscope stands. Bush was the first person to mass manufacturer his "parlor" kaleidoscope in America. Most noteworthy about the Bush kaleidoscopes were the glass pieces contained in the object case. Bush had a basic mix of about 35 pieces, a third of which were liquid filled. Inside the liquids were air bubbles that continued to move even after the object case was at rest. Both the solid and liquid-filled glass pieces were of brilliant and well-chosen colors, and the patterns they formed were the finest of any 19th century kaleidoscope. One unusual piece that comes into view in a very few of the original Bush scopes is a clear glass disk embossed with a swan. But it is the liquid-filled ampules that are by far the most distinctive feature of the Bush scope. This is the Cadillac of kaleidoscopes, invented and made by Charles G. Bush of Providence, Rhode Island. Stamped into the top of the brass cowling is "C.G. Bush & Co. Prov. R.I. Patent Reissued Nov. 11, 1873" with the image of a small single pedestal parlor scope above. This lovely example features a textured cardboard tube to simulate leather. It is fitted with a brass cowling attached by screws around which revolves a brass spoked "ship's wheel" object cell. The brass still retains the original lacquer finish. As in all Bush instruments, the object field consists of a variety of glass ampules filled with various colored liquids, shards, glass bubbles, twisted glass and even small sections of screen! All of these, together with the 5-sided reflective interior, combine to produce the most marvelous and colorful geometric images conceivable! 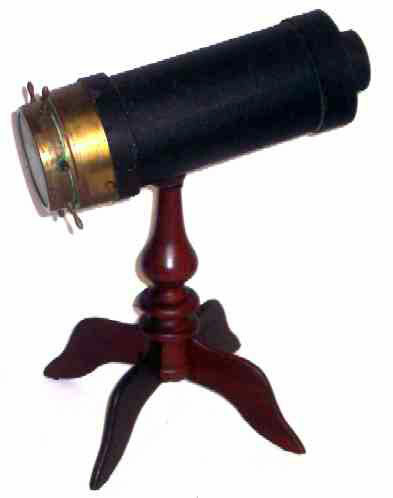 This kaleidoscope is mounted on a turned mahogany stand that is impressed with the maker s name and patented in 1874. The instrument stands 13 inches tall overall with a barrel length of 10 inches and a diameter of 3-5/8ths inches. It is in very fine condition. If you have never had the experience of viewing a Bush kaleidoscope, you are in for an amazing treat! It is a wonder for both children and adults! Even in today's world of modern, computer-generated special effects, the images produced by this 100+ year old kaleidoscope are guaranteed to bring much pleasure to the viewer.